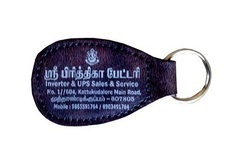 We are a Manufacturer and exporter of Prorotional Leather key chain. We will do Embossing your name and Logo as per your specification. . Custom design, shape and Color available. We are a manufacturer and Exporter of Printed Leather Keychain. Custom design, size and shape available. Looking for Promotional Key Chain ?